It’s been a busy week, so I was looking for something to throw together quickly for dinner. I had some wonton wrappers and ricotta cheese in the refrigerator and some pasta sauce and pesto in the pantry. I defrosted some Italian turkey sausage in the microwave and dinner was on the table. I like this recipe because it’s easy to prepare and subject to endless variations. You can change the type of sauce and pesto you use. You can skip the sausage and make it vegetarian. You can mix different herbs into the ricotta. You can make it spicy or mild. You could even add some chopped vegetables. And it’s way lower in carbohydrates that regular lasagna. The nutritional information below was calculated using the particular brands of pasta sauce (Classico Spicy Tomato & Basil) and pesto (Classico Traditional Basil Pesto Sauce) I used. You can cut way back on the sodium in this dish by using homemade sauces or by selecting lower-sodium versions in the grocery store. You also might want to skip or reduce the amount of Parmesan and the turkey sausage, which are both high in sodium. The sugar is coming primarily from the pasta sauce as well, so using homemade will cut down on the sugar in this recipe too. However, overall, the calorie count is fine and the carb count fits into my eating plan. Your mileage may vary. Preheat oven to 375°F. Lay 2 wonton wrappers on a cutting board, overlapping slightly. Spray with cooking spray and then insert, sprayed side down, into one cup of a 12-cup muffin pan. Repeat with remaining wrappers. In a small bowl, combine ricotta, Parmesan, oregano and basil. Mix well. Fill each of the wrapper-lined muffin cups with 1 tablespoon pasta sauce, a few chunks of sausage, 1 teaspoon ricotta mixture and 1/4 teaspoon pesto. Repeat layers. Bake until edges of wrappers are golden, about 10 minutes. Let stand in pan a few minutes before transferring to plates. (I found my fingers worked best for removing the lasagna cups from the pan.) Serve immediately. Good idea using wonton wrappers! Hi Donnalee – Thanks for sharing! 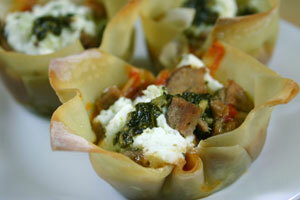 Did you cut a sheet of phyllo or use the cups?